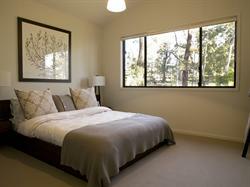 Bluebell Retreat is a haven for nature enthusiasts, bushwalkers, beachcombers and general outdoor lovers. Surrounded by great surfing, beaches, fishing spots, walking trails, sailing and boating. It is the perfect destination for a short break, family escape or romantic getaway. Nestled in the stunning surrounds of Wallarah National Park on the shores of Lake Macquarie, Bluebell Retreat combines the wonder of the natural world with the comfort of the modern, featuring an eco award winning house set harmoniously within the vivid green landscape in the centre of the NSW coastline. Bluebell Retreat House is a purpose built contemporary holiday retreat where you can "just get away from it all". Our expansive bushland and spectacular water views allow guests to truly unwind. Distinctively designed for leisure & comfort, the external & internal living can accommodate 1 to 3 couples or a family of 6 in 3 separate spaces. Fully equipped with designer furnishings, latest technologies and appliances, kitchenware and linen and Telstra 4G WiFi wireless broadband available for guest use. Guests booking as one couple or two adults will have full use of house except for the second bedroom and bathroom which will be closed off. Should you require use of the second bedroom please advise prior to arrival. The use of the second bedroom and bathroom will attract an increase in tariff. WiFi - code is next to the WiFi unit above the study desk. -Should use contravene accommodation requirements, guests will be asked to leave the property, and will be asked to pay for any clean-up and damages. The house and property is a Non-Smoking zone. Bluebell Retreat House was designed by eminent Australian architect, Gabriel Poole. Poole has been awarded the Royal Australian Institute of Architecture gold medal for his lifetime contribution to Australian Architecture. This is the highest honour the RAIA can bestow and is the pinnacle for architects in Australia. The house is Green Star thermally insulated; Reverse cycle underfloor ducted air conditioning to all the living spaces; all the bedrooms have wall mounted convection space heaters and the house has excellent cross flow ventilation. 3rd bedroom or study area contains 2 day beds (which can be used as 2 single beds or can be joined to form a queen bed), and ducted air conditioning. * the complex has a 25m outdoor pool (including access ramp), change and barbeque facilities, cabana, lounges, etc with residents only security access. * Bluebell Retreats welcome letter provides the pool complex access code. Murrays Beach is approx 120kms north of Sydney, a 90-minute drive via the F3 and Pacific Highway, on the east side of Lake Macquarie, and 30km south of Newcastle (just south of Swansea). From Sydney, just 90 minutes. Head north along the Pacific Highway to the F3. Look for the East Lake Macquarie signs (just past the Caltex roadhouse). Take the Budgewoi-Swansea-Charlestown exit (Route 111) and continue along the Pacific Highway for approx 25 minutes. Take Murrays Beach exit (Old Pacific Highway). Turn onto Jetty Point Drive, turn right into Shoreside Row, left into Nine Acres Way and then left into Saltwater Row, Bluebell Retreat is on the right. From Newcastle, just 30 minutes. Head south along the Pacific Highway (Route 111). Take the Murrays Beach exit (Old Pacific Highway). We accept cancellations up to 4 weeks prior to arrival date less the booking agent cancellation fee. Deposits for cancellations made less than 4 weeks prior to arrival date will only be refunded if they fall within non peak times less the booking agent fee. Cancellations for Peak Periods (Christmas/New Year Easter School Holidays Sporting & Special Events etc) will only be refunded if and when the accommodation is re-let for the full term of the cancellation. Part cancellations will not be accepted. Cancellations less than 14 days before arrival will not be accepted and full tariff must be paid unless we are able to re-let the property for the full term of the cancellation. If the property is rebooked only the booking agent cancellation fee will apply. Part cancellations will not be accepted.